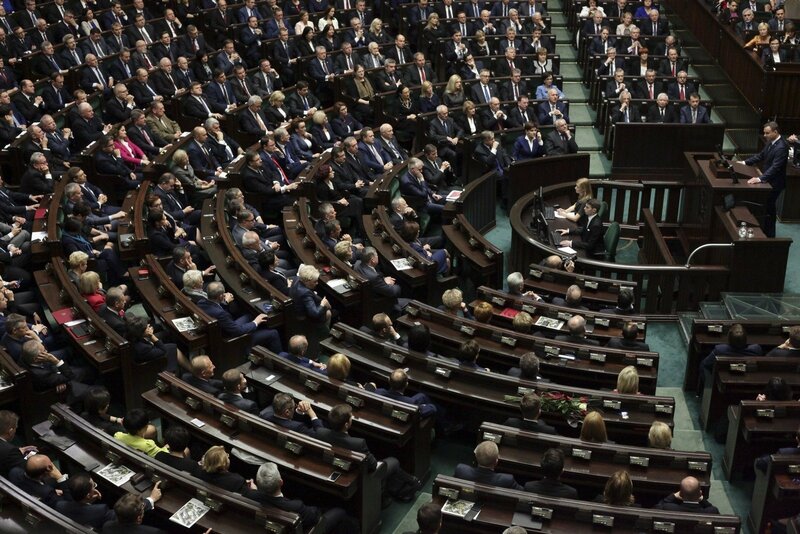 Viktoras Pranckietis, the speaker of the Lithuanian Seimas, on Thursday delivered a speech at the Polish parliament. 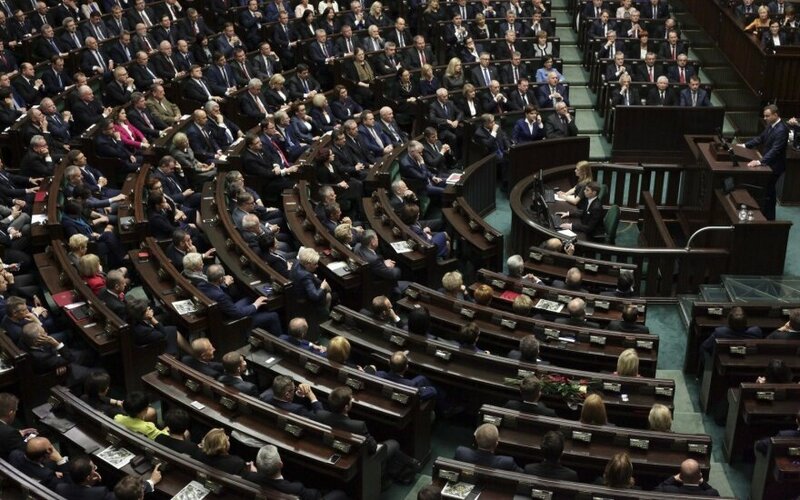 In his speech, Pranckietis reviewed the situation of ethnic Poles in Lithuania and asked Polish lawmakers to ensure that local Lithuanians have access to Lithuanian-language education in Poland. He also called on Polish parliamentarians to revive a Poland-Lithuania inter-parliamentary assembly that held its last meeting almost ten years ago. The speaker also spoke about historical links between the two neighboring countries and their current bilateral relations, as well as the security situation and the situation in the European Union. Here are key highlights of his speech. "History would bring our nations together and then apart, but in all periods of historical change, we had more things in common than things that divided and alienated us". "I think that when marking the 225th anniversary of the uprising led by Tadeusz Kosciuszko in 2019, it would be appropriate to perpetuate the memory of the defenders of Warsaw and the soldiers of the Grand Duchy of Lithuania who died here." "Lithuania's Poles and Poland's Lithuanians are invaluable assets of our states. Lithuania has long been known as a multi-ethnic country fostering the co-existence and tolerance of different peoples, faiths and ethnic groups. What we strive for is that a person of any nationality in Lithuania should feel good being a member of their national group and a loyal citizen of the country. I want to underline that Lithuania is the only state in the world (apart from Poland, of course) that provides people of Polish nationality with access to Polish-language education from the kindergarten to the higher school." Pranckietis thus sought to convince Polish parliamentarians that Lithuania's authorities have taken sufficient care of the Polish ethnic minority. In his speech, he provided concrete examples to describe what situation Lithuania's Poles are in and how they are represented in the Seimas and in the European Parliament. Poland had frozen top-level visits to Lithuania for the past five years, accusing Vilnius over the situation of the Polish ethnic minority. Warsaw has softened its tone recently. "I, for my part, am calling on you, Polish parliamentarians, to constructively address the issues raised by the Lithuanian community in Poland regarding Lithuanian schools." In his speech, Pranckietis paid less attention to Poland' Lithuanians than to Lithuania's Poles. However, he urged Polish politicians to listen to local Lithuanians' requests. There are currently three Lithuanian-languish schools in Poland and a bilingual school. These schools have been asking for more funding and calling on the authorities to deal with the problem of Lithuanian-language textbooks. "The implementation of the project for the synchronization of the Baltic energy systems via Poland with the continental European network will finally and fully integrate the Baltic states into the European energy system". "In order to achieve even closer integration of our states and regions into the European Union, we must actively invest in infrastructure projects, and, therefore, I hope that our governments will do their utmost to implement the Via Baltica, Via Carpatia and Rail Baltica projects of major importance to the region." "The construction of the GIPL gas pipeline between Lithuania and Poland will be very important in ensuring the energy security of our states and in development the gas market in the region. We hope that we will implement this project by 2021, as planned." "I am convinced that in this centennial year for our states, we will properly use possibilities for Lithuanian-Polish parliamentary cooperation and will promote the activities of bilateral parliamentary assemblies." Pranckietis called for resuming meetings of the Poland-Lithuania inter-parliamentary assembly, last held on May 11, 2009. "It was not uncommon for Lithuanians to share the fate of deportees with their fellow Polish sufferers. It would be appropriate (...) to involve people from your country in Mission Siberia, which has been carried on in Lithuania for 16 years, so that young people from Lithuania and Poland could together visit places of exile and clean abandoned burial places of Lithuanian and Polish deportees". "The Seimas of Lithuania has worked out Europe's plan for Ukraine. We are asking you to support it". Pranckietis called on Polish politicians to back a plan for EU financial aid for Ukraine, dubbed as the "Marshall plan", which has been prepared by Lithuanian officials. "The European unification project is unique, and it is our responsibility to preserve it. We understand that the states' powers are relative, but the European and Euro-Atlantic collective structures of the European Union and NATO have, for the first time in history, given us the opportunity to sit together at the table and participate in decision-making on an equal footing. Nothing that concerns us can be solved without us." "We regard EU membership not only as an economic well-being of our states and citizens, but also as being part of a community of countries bound by common values. This is the basis of unity and solidarity of the European Union." "We are in the same boat with Poland when it comes to security and geopolitics". "NATO is a transatlantic political-military alliance, and, therefore, political attention from the United States (and) the presence of American troops and other allies in Poland and the Baltic states is crucial to ensuring effective deterrence against potential aggression and defense (and) to strengthening the capabilities of the entire eastern flank of NATO." "Obviously, NATO is the main security guarantee. At the same time, we should work together to ensure that the activities of NATO and the European Union do not overlap." Lithuania has taken the lead in an EU cyber defense cooperation project, but it remains cautious about discussions on the bloc's deeper defense integration. Vilnius is concerned that this may eventually reduce the role of the United States, one of its key allies, in European security. Poland takes a similar position.